The LADDER measures 2 5/8” high by 8 ¼” wide with 84 images on 22 pages. Because of its size, it is convenient to use both chairside and at the laboratory. There are 6 categories of features as referenced above; 2 of which have sub-categories providing an organized and comprehensive depiction of features.The pages are respectively identified on the top and end of each page and each page is color-coded by category. The back cover serves as a quick reference to locate specific features in the booklet. All images are the same dimension and set into the same background to eliminate distraction when referencing features. Because of the booklet format, multiple pages (and images) can be viewed simultaneously for comparison and ease of use. The SHADE LADDER accompanies The LADDER as a secondary reference that is not designed for chairside use. The SHADE LADDER takes more common features from The LADDER and displays them on Vita A, B, C, and D templates. This booklet visually demonstrates how features may sometimes appear different when the background or shade is varied. 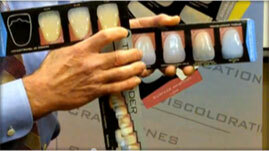 The LADDER Rx completes the line of communication between the dental office and laboratory. Since all features have accompanying descriptions and codes, it is a simple matter of mapping features in the tooth outlines on The LADDER Rx. There are 2 (two) Rx pads that are part of The LADDER system. One is in single-tooth format with outlines for Shade, Translucency, Characterizations, and Surface Anatomy. In addition, The LADDER Rx allows for prescribing the Stumpf shade(s), Value, and Chroma. A 2nd Rx pad is in multiple-tooth format for prescribing varied features in a single multi-unit case. For the laboratory, The LADDER Rx enables in-house documentation of features during the fabrication process. Notes can be readily made to an unchanging standard instead of re-inventing-the-wheel for each patient.